Having rules/expectations for behavior in the classroom is a great way to encourage positive behavior if used correctly. For rules to be effective: keep them short and to the point, do not have too many rules (3 to 5 is a good rule of thumb), and phrase them in the positive (kids respond better when you tell them what to do instead of what not to do). To set the rules, review them with the class as soon as you put them up. Some teachers like to create the rules with the students. However you choose to create them, once you have your rules posted and you have reviewed them with the class, have all students sign an agreement to follow them each day. Review the rules with the class each morning. You could even pick one student each day to recite them. You may need to review the rules every day all year or at least until all students are following the rules each day. Some classes may need a review of rules once in the morning and once in the early afternoon. This may be helpful for very young students or a class who has several students with challenging behavior. Some students even benefit from having the rules laminated and posted on their desks. Teaching rules and procedures to students at the beginning of the year and enforcing them consistently across time increases student academic achievement and task engagement (Evertson, 1985; 1989; Evertson & Emmer, 1982; Johnson, Stoner, & Green, 1996). When teachers are inconsistent in their enforcement of expectations, students become uncertain of what those expectations are and whether the expectations apply to them (Evertson, Emmer, & Worsham, 2003). When you catch a student following a rule, reinforce it by acknowledging it. For instance you could say something aloud to the student like, “thank you for raising your hand.” You could give them positive body language (e.g., thumbs up/smile) or you could give them a note at the end of class (“You have been trying really hard today. Keep up the good work.”). This might be helpful for students who don’t like to receive praise in front of the class (but, if praise is a regular part of the classroom dynamic, many students probably would not be embarrassed by it). You could also let the whole class know when they are having a good day (e.g., everyone did a really nice job following our class rules today). If students are still having difficulty following the rules, you may need to try additional measures such as setting up a system to have students earn privileges such as “free time” or “choice of activity” for following the rules. 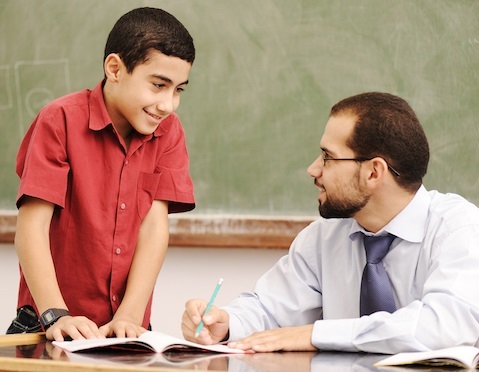 Some people think that we should not praise students for doing the right thing, but giving specific feedback allows students to know what we are looking for and what we want more of. I remember at one of my first jobs in the mental health field, my supervisor told me that I was diligent with my paperwork. This made me want to be more diligent. It did not cause any problems in my work performance or make it so I could not do anything without being praised for it. People like to hear when they are doing the right thing, and then often times want to do more of it. If a student breaks a rule you can use one of the following strategies: point to the rule as a reminder, model the rule (e.g. raise your own hand to remind the student to raise his), state the rule (e.g., “raise your hand and wait to be called on”) or have the whole class recite the rule you point to. This is helpful if you are trying to avoid singling a student out. For students having consistent difficulty following the rules (which should be few if you have an effective system in place), talk to your school team to discuss what additional strategies might be helpful. I also recommend How to Motivate Your Students and Get Them to Listen to You (39 Essential Strategies for Classroom Management) which discusses rule implementation and other classroom management strategies in more detail. While classroom rules are helpful if implemented consistently, there are many classroom strategies that work together to make a positive classroom climate. Should Your Rules Be In Visual Form? Because some students cannot read and some students understand images better than verbal input, it is important to display your rules in visual form as well. This can be particularly helpful for very young students or students who have trouble with language processing, such as those on the autism spectrum. 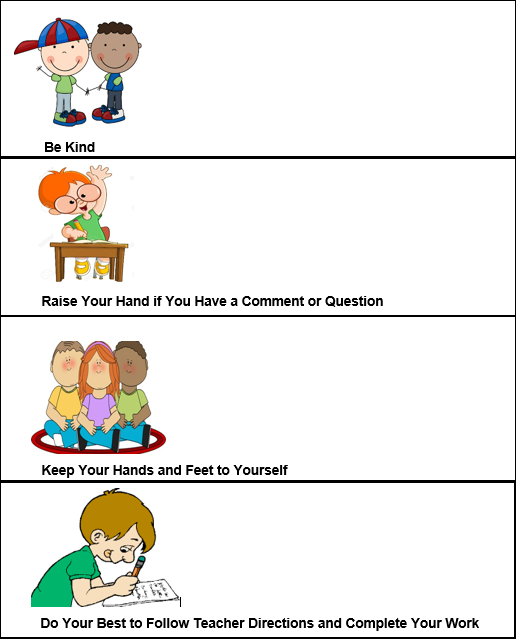 Below is an example of classroom rules with visuals. There are four rules. They are short, to the point, and phrased in the positive. Below this image is a downloadable Microsoft Word version so you can change it around to fit your classroom needs. For instance, the “raise you hand” rule may not be appropriate in a classroom that is primarily based on group work and reciprocal discussion. Once you have it the way you like it, you can print it out. Thank you for visiting educationandbehavior.com. We have so many free supportive strategies to help children in the areas of learning, behavior, and social-emotional development! Follow us on Facebook! Please share this resource!